If you remember, Microsoft several times initiated an inexpensive Pocket PC equipped with basic functions. It seemed that time would go by and Pocket PC would become available for many, it could be bought for $150 or even $100. However, such solutions didn’t come out, moreover the average price of the sold PDA has recently jumped. It turns out that only Palm makes PDAs in the price range below $200, the situation hasn’t changed over many years. We’ll talk today about Palm Z22, on the one hand the model replaces the monochrome Palm Zire 21, on the other hand – a more expensive handheld Palm Zire 31 with a color screen, additional opportunity to play MP3 and an expansion slot. The recommended price for the Z22 makes up $100. I’d note there appears a gap in the $100-200 segment. It’s logical to expect from Palm to announce a model, let’s call it the Z32, which will have the price tag of $150 and occupy this free segment. The model doesn’t have any peculiarities in design, lacks wireless adapters and expansion slots and is equipped with a small LCD and poor kit, which contains only essential things. This is a sacrifice to the price. 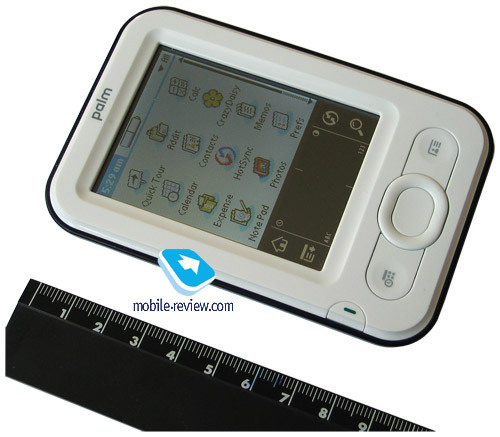 The reviewers haven’t liked the original Palm Zire putting a verdict “Not a pocket PC, but an advanced address book”. Palm positioned that model the same – a paper substitute (marketing issues put the paper the key rival) and not a pocket multimedia entertaining center. In result Palm Zire managed a million release (being sold in supermarkets and in fuel stations in the US), the fact greatly improved the annual financial report of Palm in the late 2003. It turned to be a shrewd marketing move – positioning stationery instead of a digital gadget aimed at sudden buys. The Zire 21 had little changes in design compared to the predecessor, but inside it had new processor, RAM, operating system. The Zire 21 enjoyed high sales in the US. 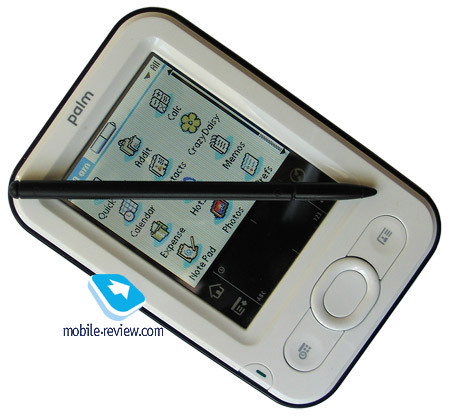 Palm Z22 differs from its predecessor in design and in the filling. Let’s start with its form. The dimensions and weight decreased – 103x68x15 mm and 96 g. Currently this is the smallest and lightest PDA. You can carry it anywhere, in the pocket of the trousers or the shirt, you won’t feel its weight. The handheld fits the palm, its small size doesn’t prevent from a comfortable use. The Z22 features a nice design mainly due to the iPod influence and compact size. The other half of the PDA as if runs over to the front panel making the black band round the white front part. The latter is made of white glossy plastic. Other parts are made of semi-translucent blue plastic, so you can see some of the PDA insides through them (that’s for the first time in the PDA). In all, Palm Z22 doesn’t look cheap like previous models, but doesn’t produce an impression of expensive design. The sides are smooth and free from buttons and switches. The ends are leveled, so the device lies comfortably in hands. The number of control elements on the front panel increased greatly: there appeared a full-featured navigation button and Calendar and Contacts buttons by its sides. The power button got an inconvenient position – at the bottom left angle of the LCD. If you already hold the PDA, you have to switch it on with your free hand. But that’s rather a fault-finding matter than a real flaw. Besides you get accustomed to this location very quickly. On the top end we see a charger connector, a miniUSB-client for synchronization and charging, an unnoticeable infrared port and a silo. The whole stylus pen is made of plastic, has average size and is comfortable in use. That’s all, there is neither a speaker or a headphones jack or an expansion slot. Unlike the previous model the Z22 is equipped with a color LCD, which is the main innovation in the model. However it has a shorter diagonal 2.4”, 160x160 pixels and made under STN technology, with 4K colors (there is no exact info in the specs, they mention thousand colors). At last, the LCD got rid of its main flaw – now it’s a backlit one, so you can read e-books in the dark. The screen picture becomes hardly readable under the direct sunlight. The sales package is minimal – it contains only essential items (the charger, the sync cable, the CD with the software). I’d mark the kit no longer has a rubber cover, which used to be uncomfortable and added cheap look to the PDA. Compared to the previous model the memory size is 4 times as much (16x against the original Zire). The User can access 20.5 MB of memory, which is enough for several dozens books and necessary programs. That’s quite relevant, as there is no opportunity to extend the memory with storage cards. I’d mark, the Z22 has NVFS file system, i.e. at the strong battery discharge you won’t loss the data. That’s important for those who will use the PDA once a week or rarely. The PDA works on an ARM-compatible processor by Samsung 200 MHz (the predecessor was equipped with Texas Instruments processor). The PDA lacks multimedia opportunities, thus it has excessive productivity, which is not in need. Palm Z22 carries a non-removable Li-Ion battery onboard. At the mid backlight level the PDA was good for 8-10 hours. You can expect it work for a week using it 20-30 minutes per day. The handheld is powered by Palm OS 5.4.9. One of the improvements in the Z22 software is the opportunity to work with many applications single-handedly, remember the model is equipped with a full-featured navigation button. In addition to the standard virtual keyboard there is Graffiti 2 manuscript recognition system. The handheld comes with the following preinstalled programs. Quick Tour. This is an application for newbies providing a PDA tour and telling about application buttons and the Graffiti zone. Calc. This is an ordinary calculator, nothing more. Contacts. Work with contacts – one of the main assignments. It contains 17 fields and 4 fields to be changed by the user. The user can assign a category (for example, work) and add a text note. The number of contacts is limited by the free memory. Contacts are correctly synchronized with MS Outlook. You can also attach a photo to the contact, it will be synchronized with MS Outlook 2003 or higher. Calendar. It keeps the schedule and the task list. Traditionally everything is quite comfortable and clear. You don’t need a larger screen than the Z22 has to organize your schedule. The calendar gets correctly synchronized with MS Outlook. Expense. The utility keeps track of your personal finance. You can enter expenses by dates and categories. HotSync. It’s a PC synchronization application with the synchronization log. It displays the time and the date of the last synchronization. Memos. This application is designed to keep text memos dividing them by categories. Memos can be synchronized MS Outlook. Note Pad. The program keeps your short hand-written notes. For example, you can enter the list of products to buy. Photos. It’s a new built-in application to view graphical images. Prefs. It keeps almost all system settings. Tasks. It manages tasks featuring categories, task priority, complete status and the deadline. All the tasks get easily synchronized with MS Outlook. World Clock. displays local time in selected cities and towns of the world. You can set the alarm clock. 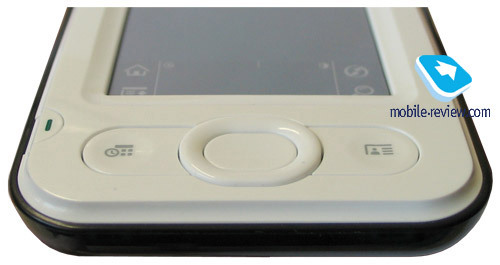 The Zire sub-brand is in the past, the handheld is called just Palm Z22. The concept of the PDA remains the same – this is the simple model without expansion slots, wireless adapters, normal big LCD. The model is good to read books, keep contacts and handwritten notes, use the calculator and play simple logical games. It fits the name “electronic organizer”, as it is too simple to be a PDA. Palm Z22 doesn’t have direct rivals. However we can consider some cell phones priced at $120-140 with the organizer and PC synchronization opportunity its indirect rivals. We thank DiFo company for the equipment provided for tests.